How is this Legacy of Hope Capital Campaign different from the Partners in Charity Annual Appeal? Partners in Charity funds vital, day-to-day operations for one year for 28 ministries, and serves three specific areas in the Diocese: Charity, Education, and Ministry. 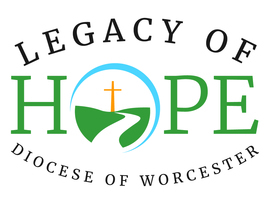 Legacy of Hope funds vital, long-term needs for a more secure future, and serves 6 specific areas: Priests&apos; Retirement/Custodial Care, Catholic Education, Parish-based Charitable Outreach, Parish-Based Evangelization, Parish Support, and Structural Repairs at the Cathedral. The picture below shows explains the difference as well. How were the parish targets determined? Parish target calculations are based on 115% of the 2017 Offertory Giving. As part of Legacy of Hope Capital Campaign, 40% of every dollar raised up to the parish target will stay at the parish for their own projects, as determined by parish leadership. For every dollar raised above the parish target, 60% will be returned to the parish. Is our parish target an assessment? No, the established parish targets are not an assessment. All parishes are asked to conduct a “Good Faith Effort” and work with their assigned Campaign Director to achieve their target to the best of their ability. Parishes will receive their first disbursement six months after the conclusion of their Block. Payments will then proceed quarterly throughout the redemption of the campaign. Is this campaign replacing the Partners In Charity Appeal? No. The Partners In Charity Appeal will continue in its normal fashion while this campaign is in progress. Each year the roughly $5 million that the Appeal brings in is spent to fund all the ongoing works and ministries of the Diocese. Traditionally, offertory giving should remain consistent. Parish leadership and Counsel will make sure to communicate to parishioners to consider a greater sacrifice and commitment above and beyond their regular offertory giving and should not lower their offertory giving to their parish in order to make a gift to this effort. Pledges are not legally binding. If the donor’s financial situation changes such that a pledge cannot be satisfied, simply communicate with the Diocesan Development Office and inform them of the changes so they can adjust or cancel the pledge. No. The Diocese is obligated to restrict these funds for the stated elements. The funds raised for the campaign will be used exclusively for the named case elements and expenses. The monies will immediately be split between the parish share and diocesan share. In terms of the diocesan share, the case elements will be funded proportionally.